IF YOU WERE FREE TO TAKE any picture in the world home to live with, which would you pick? I suppose that's the ultimate art lover's fantasy. In the hands of the very rich it leads to avaricious acquisition or by the unscrupulous to spectacular theft, but for the rest of us it leads to art museums and to a harmless daydream. One of my choice daydreams involves a trip to the Frick Museum in New York City to look at a picture by a favorite painter. A small museum on the corner of 5th Avenue and 70th Street, the Frick is the former mansion of the 19th century steel baron, Henry Clay Frick. Small though it is, it's one of the world's great museums. Frick was one of many Americans who sought to purchase European culture holus-bolus, and one of the rare few who succeeded. Today the museum which bears his name is filled with treasures in painting, sculpture, and the decorative arts. Central to these is Giovanni Bellini's St. Francis in Ecstasy. A magnificent example of early Italian oil painting, its also a culminating masterpiece of the Italian Quattrocento, that century of naturalism preceding the High Renaissance To my eyes, Bellini's paintings are "natural" beyond those of any other painter except, perhaps, Monet. His art that never parades virtuosity and never strains after affect. Like Monet's, it's filled with acute observation, but that observation is always transformed through consummate but self effacing art. But the Frick Museum's "St. Francis" is an exception even among Bellini's works. Consider, for one thing, its pristine condition. Today, after almost 500 years, it looks like it was painted yesterday. To be sure, it was painted well, but it must have been lovingly cared for since the day it was born. Where did it come from? How many owners has it had over almost 500 years? Dating from about 1480, it's a large, early oil painting on wood panel, and exemplifies the emergence of oil painting in Venice. (Later Venetian pictures were painted on canvas.) So it comes from a moment in history when oil painting was new to Italy and when for painters the world was young. The picture isn't "painterly." Oil paint hadn't yet learned to build thick textures and to drag paint for expressive effect -- that came later, with Bellini's student successors Giorgione and Titian. Instead, it exemplifies a time when painters had learned to represent the natural world -- a world new to art -- with accuracy and skill, a skill enhanced enormously by oil paint. In Bellini's hands, the new medium gave vibrant, almost enamelled colour that set forth the details of nature each in its proper place; no obscurity there. In a sense, St. Francis in Ecstasy is the ultimate achievement of that 15th Century naturalistic impulse. 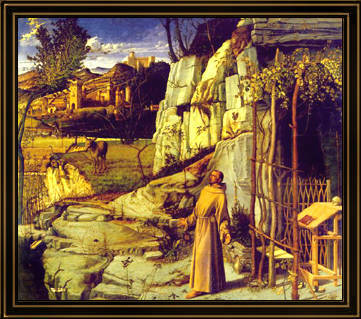 The picture celebrates the natural world on two levels: in terms of Bellini's vision as well as the vision his subject, St. Francis of Assisi, the great saint who loved the world and all it contained. Within a complex landscape, bathed with morning light, St. Francis steps forth to greet "Brother Sun" and a new day rendered in loving detail by a very great artist. At once naturalistic and visionary, this is one of the world's perfect pictures.